Vinylmation. What is it? It’s the next wave in the Disney collector craze — a series of toys sold exclusively at Disney theme parks, beginning in 2008. 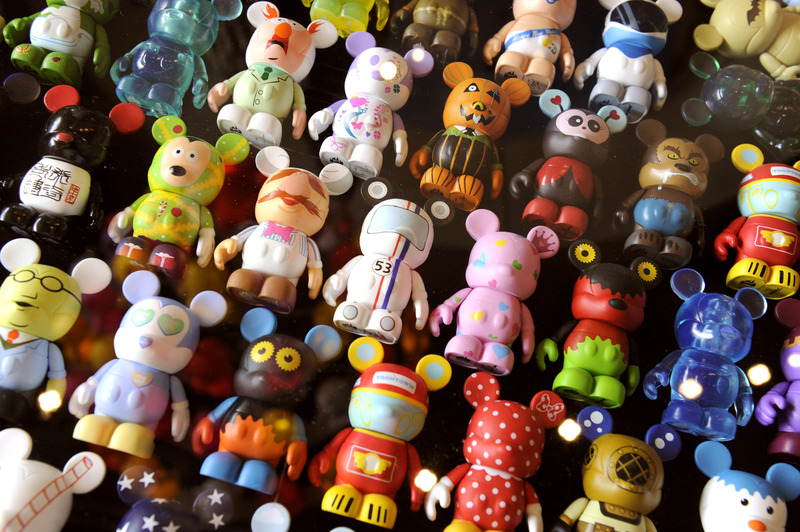 The figures all start out as a plain vinyl Mickey Mouse, then are transformed by artists to resemble various characters and objects from Disney theme parks and movies. Ranging in size, the typical Vinylmation is 3 inches tall, but some are available as 1.5-inch Vinylmation Jr. keychains or larger 9-inch figures. Vinylmations are sold in series, with varying release dates and subjects. Series released so far include the Park Series, Urban Series, Muppets, Cutesters, Holiday, Sports, Toy Story, The Animal Kingdom, and more. Some Vinylmation series are sold in clear boxes, so you know what you’re getting ahead of time, while other figures are packaged in a “blind box” or “mystery box,” which means you won’t know which figure you are getting until purchased. The mecca for Vinylmation purchasing and trading is D-Street at Downtown Disney, where product releases and events are held with Vinylmation artists. Aside from D-Street, Vinylmation can be found at many gift shops throughout Disney World, and some can be found at disneystore.com. FAQ from Disney, including where to buy and trade Vinylmations at Disney World, can be found here. This entry was posted on Sunday, December 5th, 2010 at 3:08 pm	and is filed under Uncategorized. You can follow any responses to this entry through the RSS 2.0 feed. You can leave a response, or trackback from your own site. This is the first collection of merchandising that I admit I just don’t understand the appeal. There is s ton of Disney merchandise I wouldn’t buy but can appreciate why people would … Vinylmation is not one of those. As the collection available to fans grows, I find it peculiar. Deb — I was definitely perplexed by Vinylmation too, until I happened on the Animal Kingdom series while shopping at the Expedition Everest gift shop. I had to get the leopard, it was just so cute. I also got a Vinylmation Jr. keychain, which came in a blind box, and I lucked out and got Donald. But overall I don’t see myself sinking hundreds into collecting them! My daughter is so into this Vinylmation… She never misses to have something every time we get to visit Disney World. Her love and appreciation with all the Disney characters, I believe made her so attracted to all the collectible items. At the beginning I find it a waste of money but as her passion getting stronger and stronger I realized how big her smile is having all of those collections.